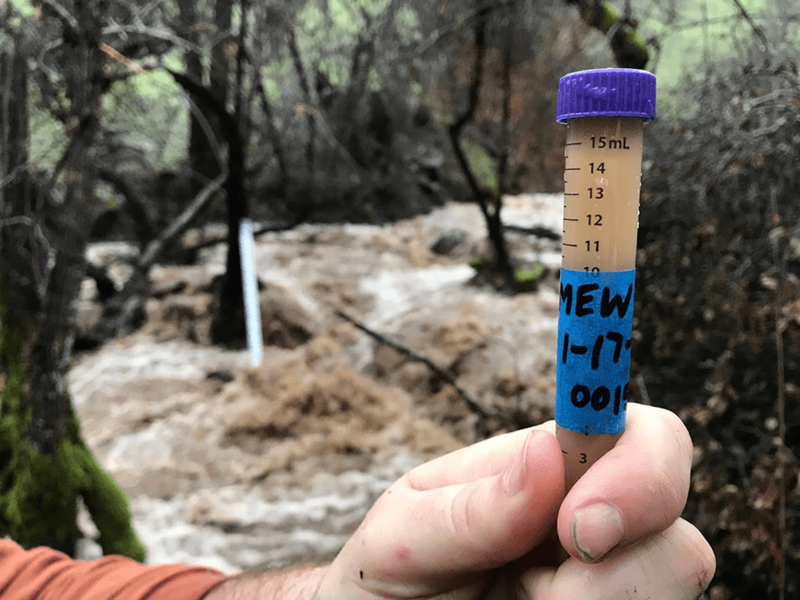 Staff research associate Chad Hecht holds a sample tube of water taken from Mewhinney Creek as one in a series of storms poured water across Northern California in mid-January. Photo by lab assistant Carly Ellis. Researchers measure streamflows at key locations during atmospheric river events to help Scripps Oceanography’s Center for Western Weather and Water Extremes (CW3E) improve forecasts for the impact of the long narrow bands of atmospheric water vapor that can deliver heavy winter storms to the western United States. In addition to monitoring and downloading data from instruments in this rugged region northwest of Clear Lake, Hecht and Ellis were collecting a water sample for isotope testing that will determine how much of the streamflow came from groundwater and how much came from surface runoff directly from the storm. “The Mewhinney Creek watershed was burned last year in the Ranch Fire of the Mendocino Complex fire, so this is actually the highest flow and turbidity we've seen at this site, with hardly any vegetation to absorb the precipitation and hold the soils in place,” Ellis noted.